In the rat, the maintenance of gestation is dependent on progesterone production from the corpora lutea (CL), which are under the control of pituitary, decidual and placental hormones. The luteal metabolism of progesterone during gestation has been amply studied. However, the regulation of progesterone synthesis and degradation during pseudopregnancy (PSP), in which the CL are mainly under the control of pituitary prolactin (PRL), is not well known. The objectives of this investigation were: i) to study the luteal metabolism of progesterone during PSP by measuring the activities of the enzymes 3beta-hydroxysteroid dehydrogenase (3betaHSD), involved in progesterone biosynthesis, and that of 20alpha-hydroxysteroid dehydrogenase (20alphaHSD), involved in progesterone catabolism; and ii) to determine the role of decidualization on progesterone metabolism in PSP. PSP was induced mechanically at 10:00 h on the estrus of 4-day cycling Wistar rats, and the stimulus for decidualization was provided by scratching the uterus on day 4 of PSP. 3betaHSD and 20alphaHSD activities were measured in the CL isolated from ovaries of PSP rats using a spectrophotometric method. Serum concentrations of progesterone, PRL, androstenedione, and estradiol were measured by radioimmunoassay (RIA). The PSP stage induced mechanically in cycling rats lasted 11.3 ± 0.09 days (n = 14). Serum progesterone concentration was high until day 10 of PSP, and declined thereafter. Serum PRL concentration was high on the first days of PSP but decreased significantly from days 6 to 9, having minimal values on days 10 and 11. Luteal 3betaHSD activities were elevated until day 6 of PSP, after which they progressively declined, reaching minimal values at the end of PSP. Luteal 20alphaHSD activities were very low until day 9, but abruptly increased at the end of PSP. When the deciduoma was induced by scratching the uterus of pseudopregnant animals on day 4 (PSP+D), PSP was extended to 18 ± 2.2 days (n = 8). In PSP + D rats, serum progesterone and PRL levels, and luteal 3betaHSD activities were higher than in pseudopregnant rats on day 11. Decidualization also prevented the increase in luteal 20alphaHSD activities observed on day 11 of PSP. Administration of the dopaminergic agonist CB154 in PSP + D rats on day 10 of PSP induced a decline in both serum PRL and progesterone on day 11 of PSP, values that were not different from that of pseudopregnant controls. We have established that during the final period of PSP a decline in progesterone biosynthesis occurs before the increase in progesterone catabolism. We have also shown that decidualization in pseudopregnant rats extends the life of the CL by prolonging the production of pituitary PRL, and by maintaining high 3betaHSD and low 20alphaHSD activities within the CL leading to sustained production of progesterone. In the rat, the maintenance of gestation is exclusively dependent on progesterone production from the corpora lutea (CL) primarily under the control of lactogenic hormones [1, 2]. The luteal metabolism of progesterone during gestation in this species has been amply studied. Progesterone is increased in systemic circulation throughout pregnancy and is exclusively produced by the CL that exhibit enhanced expression of enzymes involved in progesterone synthesis, such as P450 side chain cleavage (P450scc) needed for the formation of pregnenolone from cholesterol [3–5], and 3beta-hydroxysteroid dehydrogenase (3betaHSD) that converts pregnenolone to progesterone . 20alpha-hydroxysteroid dehydrogenase (20alphaHSD), the enzyme that catabolizes progesterone giving rise to a metabolite without progestational capability, and, therefore, incapable of supporting pregnancy, has been shown to be negligible both, at the level of mRNA, and protein expression and activity throughout most of pregnancy [7, 8]. It is only before parturition, at a time when the tropic support of lactogenic hormones is interrupted due to the down regulation of luteal prolactin (PRL) receptors [8–10], that 20alphaHSD is abruptly expressed [8, 11, 12]. The activation of 20alphaHSD has been generally accepted to be a marker for luteal regression [13–18]. Interestingly however, we have detected that early regression of the pregnant rat CL is characterized not only by the increase in 20alphaHSD luteal activity but also by a decline in 3betaHSD luteal activity [19–21]. Whereas much information exists about the metabolism of luteal progesterone during pregnancy, less information is available on the regulation of progesterone synthesis and degradation during pseudopregnancy (PSP), in which the CL are primarily under the control of pituitary PRL. These CL have constituted the subject of numerous investigations in which the regulation of luteal function is simplified by the role of only the pituitary, without involving placental factors. It is not clear, however, whether the biosynthesis and catabolism of progesterone in the pseudopregnant rat CL are similar to that described in pregnancy. If a uterus of a pseudopregnant rat is mechanically stimulated on about the time when implantation of a fertilized egg would occur, i.e., four days after the stimulus of the coitus, the pseudopregnant uterus develops a decidual reaction, mimicking the reaction of the uterus during blastocyst implantation [22–24]. It is well known that this decidual tissue is the source of a factor or factors that either directly or indirectly target the CL and extend their capacity to produce progesterone, and, consequently, the pseudopregnant stage [25–27]. The nature of the decidual factor targeting the CL, also known as decidual luteotropin [28, 29] has not yet been clearly established. It was recently demonstrated that rat decidual cells are capable of synthesizing PRL, which is indistinguishable from that of pituitary origin . These results strongly suggest that decidual PRL may indeed be decidual luteotropin, and may extend luteal function beyond day 11 of PSP, i.e., after the pituitary can no longer produce PRL. The present investigation was undertaken to study the metabolism of progesterone within the CL during PSP, evaluating luteal 3betaHSD activity as a marker of progesterone biosynthesis and luteal 20alphaHSD activity as a marker of progesterone catabolism. The effects of the formation of the decidual tissue on 3betaHSD and 20alphaHSD activities within the CL of PSP were also studied. Finally, experiments were performed to define whether the luteotropic effect of the decidual tissue is mediated through the production of decidual and/or pituitary PRL. Adult female rats bred in our laboratory (originally Wistar strain) and weighing 180 to 220 g were used. The rats were housed under controlled light (lights-on from 06:00 to 20:00 h) and temperature (22°C to 24°C) conditions and had free access to standard rat chow (Cargill, Mendoza, Argentina) and tap water. To induce PSP, stimulation of the uterine cervix was performed with a wood rod for 30 sec at 10:00 h on estrus. The next day, the first day of diestrus, was designated as day 1 of PSP. Animals were handled according to the procedures approved in the Guide for the Care and Use of Laboratory Animals . The stimulus for deciduoma induction was provided to both horns of the uterus by scratching the antimesometrial surface on day 4 of PSP with a hooked needle, as described by De Feo . In the first experiment, the extent of PSP in our rat strain was assessed by daily performing vaginal smears in a group of PSP animals to certify the duration of a constant diestrus, which is an indirect evidence of luteal phase length. Once the duration of PSP was established, rats on different days of PSP were sacrificed at 18:00 h. Trunk blood was collected after decapitation and the ovaries obtained. The CL were isolated under a stereoscopic microscope and kept at -80°C until the measurement of the enzyme activities. In a second experiment, deciduomas were induced in a group of animals, and the duration of PSP, evaluated by vaginal smears, was studied. An additional group of animals bearing deciduomas was sacrificed on day 11 of PSP, and both uterine horns were weighed. The average uterine weight of animals on day 11 of PSP that had been sham operated and did not bear deciduoma, was used as the control. At sacrifice, trunk blood was collected after decapitation to measure concentrations of hormones, the ovaries were obtained, and the CL were isolated to measure enzyme activities. In a third experiment, a group of deciduoma-bearing pseudopregnant animals was treated with the dopaminergic agonist bromoergocryptine (CB154, 2 mg/kg s.c.) on day 10 of PSP at 10:00 h, and sacrificed on day 11 of PSP at 18:00 h. An additional group of animals treated as indicated above, was used to record the extension of PSP by counting the number of consecutive days of diestrus as revealed by the vaginal smears. The activities of the enzymes were measured according to Kawano et al. with a slight modification. CL from each animal were homogenized in 0.7 ml of Tris-HCl, 0.1 mM EDTA (pH 8) at 0°C with a glass homogenizer. The homogenates were centrifuged at 105,000 g for 60 min. The supernatant fluids were used for the assay of 20alphaHSD activity. The precipitates were rehomogenized with 0.7 ml of 0.25 M sucrose and centrifuged at 800 g for 5 min. The supernatants were used as the enzyme solution for the assay of 3betaHSD activity. Both enzyme activities were assayed spectrophotometrically, dependent on the increase in NADH or NADPH in 1 min at 37°C and values were expressed as mU/mg protein. Serum PRL was determined by radioimmunoassay (RIA) using reagents kindly provided by the NIDDK (Bethesda, MD, USA). Results were expressed in terms of rat PRL RP-3 standard. The sensitivity of the assay ranged from 0.5 to 256 ng per sample. Inter- and intra-assay coefficients of variation were less than 10%. Progesterone concentrations were measured by RIA using an antiserum developed in our laboratory [34, 35]. The sensitivity of the assay was less than 16 nmol/l of serum and the inter- and intra-assay coefficients of variation were less than 10%. Estradiol concentrations were also measured by RIA using a commercially available kit (Diagnostics Systems Laboratories, Webster, TX, USA). The sensitivity was 2.2 pg/ml, and the inter- and intra-assay coefficients of variation were 7.5 % and 9.3% respectively. Androstenedione was assayed using a RIA developed and validated in our laboratory as previously described . The sensitivity of the assay was 6 pg/tube and the intra- and inter-assay coefficients of variation were 4.4% and 16.7% respectively. When variances were homogeneous, Student t-tests were used to determine for significant differences between the means of two groups, and one-way analysis of variance (ANOVA) followed by Tukey's multiple comparison test was used for multiple comparisons. When variances were not homogenous, the Mann-Whitney U test was used to compare two groups, whereas Kruskal-Wallis followed by Dunn's multiple comparison test was used to compare three of more groups. The results were expressed as the mean ± SEM and a value of p < 0.05 was considered significant. Pseudopregnant rats sacrificed at 18:00 h showed elevated concentrations of circulating progesterone from days 3 to 9 of PSP, whereas the hormonal levels declined significantly after day 10 of PSP as compared with those measured on day 9 (Fig. 1A). PRL, also measured at 18:00 h, was significantly higher on day 3 of PSP when compared with the subsequent days of PSP in which the hormone was detected at lower levels (Fig. 1B). Luteal 3betaHSD activity was elevated on days 3 and 6 of PSP, decreased significantly from day 7 thorough day 10, and declined even further on days 11 and 12 of PSP when compared with values measured on days 3 and 6 (Fig. 1C). In contrast, luteal 20alphaHSD, which showed a very low, yet measurable activity throughout most of PSP, abruptly increased on day 11 and remained elevated on day 12 of PSP (Fig. 1D). Serum concentrations of progesterone and prolactin, and luteal 3betaHSD and 20alphaHSD activities in rats throughout pseudopregnancy Pseudopregnant rats were sacrificed at 18:00 h on each of the days of PSP studied. Trunk blood was obtained after decapitation and serum progesterone (Panel A) and PRL (Panel B) concentrations measured by RIA. The CL were isolated and 3betaHSD (Panel C) and 20alphaHSD (Panel D) activities were measured spectrophotometrically. Results are mean ± SEM of groups of 5–12 animals. Columns with different letters differ significantly. Panel A: a vs. b, p < 0.05. Panel B: a vs. b, p < 0.001. Panel C: a vs. b, b vs. c, p < 0.01; a vs. c p < 0.001. Panel D: a vs. b, p < 0.001. The presence of the deciduoma, evaluated by recording the weight of the uteri (controls: 0.32 ± 0.09 mg, n = 6; deciduoma: 3.79 ± 0.90 mg, n = 6, p < 0.01), extended the luteal phase of PSP from 11.3 ± 0.09 days (n = 14) to 18 ± 2.2 days (n = 8) (p < 0.01). In the presence of the decidual tissue, serum concentrations of progesterone and PRL measured at 18:00 h on day 11 of PSP, were significantly elevated compared with control values measured in sham-operated pseudopregnant animals (Figs. 2A and 2B). Deciduoma-bearing pseudopregnant animals did not show any difference from the controls in the circulating concentrations of estradiol and androstenedione (Figs. 2C and 2D). Induction of deciduoma in pseudopregnant rats increases circulating progesterone and prolactin concentrations, without affecting estradiol and androstenedione Control pseudopregnant and deciduoma-bearing pseudopregnant animals were sacrificed at 18:00 h on day 11 of PSP. Trunk blood was obtained after decapitation and serum progesterone (Panel A), PRL (Panel B), estradiol (Panel C) and androstenedione (Panel D) concentrations were measured by RIA. Results are mean ± SEM of groups of 6–9 animals. Columns with different letters differ significantly. a vs. b, p < 0.01. A 6-fold increase in the activity of 3betaHSD enzyme was observed in the CL of pseudopregnant rats bearing deciduoma when compared with sham-operated control animals on day 11 of PSP, which had low luteal 3betaHSD activity (Fig. 3A). Further, 3betaHSD activity in the luteal tissue of deciduoma-bearing rats on day 11 of PSP was even higher than the activities measured in CL of controls on days 3 and 6 of PSP (see Fig. 1C). This increase in 3betaHSD activity in the presence of the decidual tissue was associated with very low luteal 20alphaHSD activity (Fig. 3B) compared with values of sham controls on day 11 of PSP. In addition, the low activity of 20alphaHSD in the luteal tissue of the deciduoma-bearing pseudopregnant animals was similar to those basal activities measured in the CL of early PSP in control animals (see Fig. 1D). Induction of deciduoma in pseudopregnant rats increases 3betaHSD and decreases 20alphaHSD luteal activity Pseudopregnant controls and deciduoma-bearing pseudopregnant animals were sacrificed at 18:00 h on day 11 of PSP. The CL were isolated and the activities of 3betaHSD (Panel A) and 20alphaHSD (Panel B) enzymes were measured spectrophotometrically. Results are the mean ± SEM of groups of 6–9 animals. Columns with different letters differ significantly. a vs. b, p < 0.01. When the dopaminergic agonist CB154 was administered at 10:00 h on day 10 of PSP to deciduoma-bearing animals, the duration of PSP, which was extended by the presence of the deciduoma, was shortened and was not different from that of sham control animals (Fig. 4A). 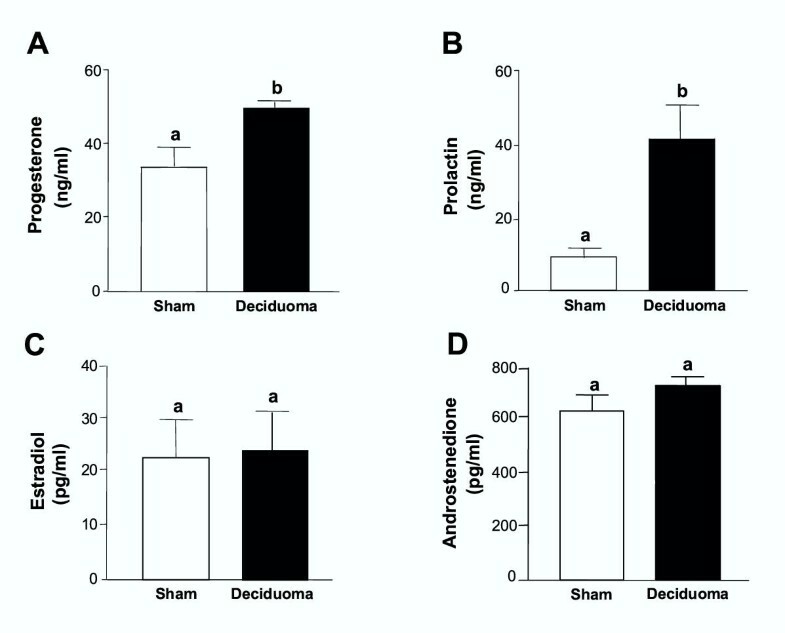 In addition, the increase in serum PRL concentration induced by the presence of the deciduoma was totally abrogated by the administration of CB154, reaching circulating values similar to those of pseudopregnant rats without bearing deciduoma (Fig. 4B). The levels of progesterone in circulation measured in deciduoma-bearing animals on day 11 of PSP treated with CB154 the day before, declined significantly compared with that of deciduoma-bearing rats treated with vehicle, and were not different from the values in the circulation on day 11 of PSP in sham control rats without bearing the deciduoma (Fig. 4C). Formation of the deciduoma extends pseudopregnancy by stimulating prolactin and progesterone production Deciduoma-bearing pseudopregnant rats were injected with the dopaminergic agonist CB154 (2 mg/kg s.c.) at 10:00 h on day 10 of PSP, and sacrificed at 18:00 h on the following day. The group receiving CB154 was compared with a control sham-operated pseudopregnant group and a deciduoma-bearing pseudopregnant group, which were treated with vehicle alone. Trunk blood was obtained after decapitation in all animals and serum PRL (Panel B) and progesterone (Panel C) concentrations were measured by RIA. In three similarly treated groups of animals, extension of PSP was measured (Panel A). Results are mean ± SEM of groups of 6–9 animals. Columns with different letters are statistically different. a vs. b, p < 0.01. The results of the present research have shown the changes in the activities of the enzymes 3betaHSD and 20alphaHSD in the CL of the pseudopregnant rat, and their correlation with the circulating concentrations of progesterone and PRL. We have shown that circulating levels of progesterone in pseudopregnant rats significantly decreased on day 10 of PSP compared with previous days, whereas the abrupt induction of 20alphaHSD luteal activity, a previously established marker for luteal regression [11, 34], did not increase significantly until day 11 of PSP. There was, however, a low yet detectable activity of 20alphaHSD in the CL throughout PSP. Based on data published by Albarracin and colleagues  we anticipated a detectable 20alphaHSD luteal activity before day 4 of PSP because the 20alphaHSD protein is expressed at low levels in the CL until day 5 of pregnancy, and, there would not be any difference between the behavior of the CL of pregnancy before blastocyst implantation compared to that of PSP. However, doing a parallelism between the CL of PSP and the CL of early pregnancy, we did not expect detecting any luteal 20alphaHSD activity between days 6 and 10 of PSP. Therefore, the detectable 20alphaHSD activity in the CL of PSP from days 6 to 10 of PSP may have a physiological meaning. It was noticeable the significant decrease in the luteal activity of 3betaHSD that accompanied the first significant drop in circulating progesterone on day 10 of PSP. This decrease in luteal 3betaHSD activity, preceding the increase in luteal 20alphaHSD activity was also observed in the regressing CL of RU486-treated pregnant rats  as well as in CL undergoing regression upon treatment with LH on day 19 of pregnancy . In regression of the CL induced by RU486, the early decrease in luteal 3betaHSD activity that preceded the rise in luteal 20alphaHSD also paralleled a significant decline in serum progesterone concentration . Curiously, whereas in the luteal regression induced by RU486 the decrease in 3betaHSD activity and the increase in 20alphaHSD activity in the CL were temporally separated for only about 10 hours , such delay was of 36 hours in luteal regression induced by LH administered on day 19 of pregnancy , and lasted approximately 4 days in the regressing CL of PSP. Thus, the regression of the CL of PSP in the rat appears to constitute a very suitable experimental model to study the sequence of molecular events occurring throughout luteal regression with a larger temporal gap as compared with luteal regression occurring in pregnant rats either physiologically at parturition, or induced by luteolytic compounds. It is possible that luteal regression inititates with a decline in the biosynthesis of progesterone by the CL, which is then followed by the activation of the catabolism of progesterone by 20alphaHSD. This line of reasoning supports results published by Bussman and Deis  showing that in pregnant rats a slow decline in circulating progesterone was observed beginning on day 19 of pregnancy, which was followed by a second and more pronounced decline after day 20. It was this second decline in serum progesterone concentration that was associated with the abrupt increase in the luteal activity of 20alphaHSD. Whereas in the work of Bussmann and Deis  only circulating progesterone and luteal 20alphaHSD activity were measured, it is likely that the first slow decline in circulating progesterone might be associated with an initial decline in luteal 3betaHSD activity as occurred in the present model of luteal regression in PSP. It is therefore tempting to speculate that luteal regression might be initiated with a decline in progesterone biosynthesis preceding the activation of progesterone catabolism. Further studies need to be conducted to prove this hypothesis. This is because even though it is clear that luteal 3betaHSD activities declined significantly on days 7 through 9 of PSP if compared with values measured on days 3 and 6 of PSP, such declines were not followed by declines in serum progesterone concentrations. It was only after a further decline in 3betaHSD activity observed from days 9 to 10 of PSP that progesterone concentration decreased in circulation, in coincidence with the activation of 20alphaHSD. Thus, it is possible that even when a decline in 3betaHSD is observed before the acute induction of luteal 20alphaHSD in PSP, it is sufficient to sustain the production of progesterone by the CL. The lower levels of circulating PRL measured on the afternoon of day 6 of PSP, compared with values on day 3 of PSP, were unexpected, yet PSP lasted about 11 days in the presence of those levels of PRL. PRL concentrations on day 6 of PSP are likely high enough to maintain CL function as reflected by high levels of progesterone and low luteal 20alpha HSD activity measured on day 6 of PSP. On the other hand, in our study only the diurnal surge of PRL was measured. Therefore, it is also possible that the nocturnal PRL surge is a large contributor to the maintenance of luteal function when the diurnal PRL surges begin to decline. The formation of the decidual tissue in pseudopregnant rats significantly extended the pseudopregnant stage, confirming early studies [22–24]. While the luteotropic nature of the decidual tissue is readily accepted, the nature of the tropic factor produced by this endocrine tissue is unknown. It is known that the tropic factors contained in the deciduoma are capable of preventing the action of luteolytic signals produced from the uterus , and that the development of the deciduoma depends on the joint action of estrogen and progesterone . The extension of the luteal function, as demonstrated by the high circulating levels of progesterone on day 11 of PSP in deciduoma-bearing pseudopregnant rats compared to pseudopregnant controls, indicates that the presence of the decidual tissue extends the luteal phase and confirms previous reports [25, 39]. In the present research we have also shown for the first time that the prolongation of the luteal phase induced by the presence of the deciduoma correlates with high levels of 3betaHSD and low levels of 20alphaHSD activities within the CL, a profile of enzyme activities observed at the beginning and at the middle of the luteal phase in PSP, but not at the end of PSP. Thus, it becomes clear that the decidual luteotropic factor or factors stimulate the CL by stimulating progesterone biosynthesis and by preventing progesterone degradation. In 1999 Prigent-Tessier and colleagues  demonstrated that the rat decidua produces PRL, whose sequence is not distinguishable from that of pituitary PRL. They also showed, however, that decidual PRL is not regulated by dopamine like pituitary PRL, and that the latter down-regulates the expression of the former . In our current investigation, the presence of the decidual tissue was associated with increased levels of circulating progesterone and PRL. Whereas early studies demonstrated the increase in circulating progesterone and extension of the pseudopregnant stage by the presence of the deciduoma, in none of those studies were the levels of circulating PRL measured. The fact that in our present studies PRL was elevated in the presence of the deciduoma prompted us to identify the organ from which PRL was being produced. Based on the studies of Prigent-Tessier et al. showing that decidual and pituitary PRL are encoded by the same gene giving rise to the same protein, we hypothesized that the elevated PRL we measured in the serum of deciduoma-bearing rats represented either pituitary, decidual, or a contribution of both PRLs. Blockage of pituitary PRL secretion with the dopaminergic agent CB154, which does not appear to block decidual PRL production , reduced the levels of progesterone to that of day 11 pseudopregnant control rats. These results suggest that the elevated circulating PRL in deciduoma-bearing animals is most likely of pituitary origin. Yet, it is still feasible that the luteotropic decidual factor, even though it appears not to be decidual PRL, targets the CL and stimulates the production of progesterone whose high circulating concentrations parallel that of PRL in deciduoma-bearing pseudopregnant rats. However, our studies also revealed that by blocking the secretion of pituitary PRL with CB154, not only PSP was shortened, but also progesterone declined in serum reaching control values. Thus, according to these data, the luteotropic decidual factor appears to indirectly regulate luteal progesterone production through the induction of pituitary PRL secretion. These results, however, need further confirmation as the literature shows some controversial data. Our studies showing that CB154 blocked the extension of PSP induced by the deciduoma agrees with early studies by Kisch and Shelesnyak [40, 41] that showed that a single dose of ergocornine methanesulfonate administered to pseudopregnant rats bearing massive deciduoma, interrupted the constant diestrus of PSP and induced the appearance of estrus 2 to 3 days later, marking the interruption of PSP. However, other studies showed that ergocornine given to deciduoma-bearing pseudopregnant rats did not shorten PSP as promptly as it did in our studies and in the studies of Kisch and Shelesnyak [40, 41], even though the duration of PSP was shorter than it would have been if the deciduoma-bearing pseudopregnant rats had not received ergocornine . Therefore, it seems clear that the regulation of luteal function by the deciduoma is indirectly mediated through the release of pituitary PRL. However, the nature of the decidual luteotropic factor or factors that stimulates the release of pituitary PRL is unknown. It is known that under certain circumstances, administration of estrogen increases secretion of PRL [42–48]. However, it is rather difficult that the effect of decidual luteotropin could be also mediated by estradiol, because circulating levels of estradiol as well as that of its precursor androstenedione did not change in deciduoma-bearing animals compared with control pseudopregnant rats. It can not be ruled out, however, that PRL surges by the pituitary could be prolonged in PSP animals bearing deciduoma by the altered estradiol/progesterone ratio. In 1981 Gorospe and Freeman  reported the ratio estradiol/progesterone to be one of the factors responsible for termination of PRL surges. In this sense, the reported unchanged estradiol concentrations in face of increased progesterone concentrations in deciduoma-bearing rats could maintain the recurrence of PRL surges. It is also possible that the factor or factors produced by the decidual tissue that extends the life of the CL of PSP could indirectly target the production PRL-inhibiting factors from the uterus. The existence of factors derived from the nonpregnant uterus that inhibit PRL secretion by acting directly on the hypothalamus-pituitary axis was proposed by Freeman from studies in cervically-stimulated ovariectomized rats . Therefore, the nature of the signal being generated in the decidual tissue and influencing the secretion of pituitary PRL, remains an interesting subject for further investigation. We have shown that functional luteal regression in the pseudopregnant rats involves a decline in the progesterone biosynthetic capacity of the CL that precedes activation of progesterone inactivation through the 20alphaHSD enzyme, a known marker of luteal regression. This temporal gap occurring between the decline in progesterone biosynthesis and activation of the progesterone catabolic machinery in the CL of PSP is a promising experimental model to study in detail the sequence of molecular events leading to luteal regression. In addition, our results strongly suggest that the luteotropic effect of the decidual tissue in rats is mediated through the secretion of pituitary PRL, which in turn stimulates progesterone biosynthesis by increasing luteal 3betaHSD activity, and inhibits progesterone catabolism by diminishing luteal 20alphaHSD activity. A luteotropic effect of the decidual tissue mostly mediated through the release of pituitary PRL adds a new mechanism as to how the well-known luteotropic effect of the decidual tissue in rats is elicited. This manuscript is dedicated to the memory of Professor Luis I. Aguado (1946–2003). We are grateful to Dr. Barbara Goodman for the critical revision of the manuscript. This work was supported by grants 5 P20 RR16479-02 from NIH/NCRR, and PICT 1999-05-06877 BID 1201-OC AR from the National Agency for Research and Technology of Argentina. MC carried out the experiments involving animals, measured enzyme activities and hormone concentrations, and participated in drafting the manuscript. RD participated in the design of the study. CT conceived the study; participated in its design and coordination, and drafted the manuscript. All authors read and approved the final manuscript.